Sorry. 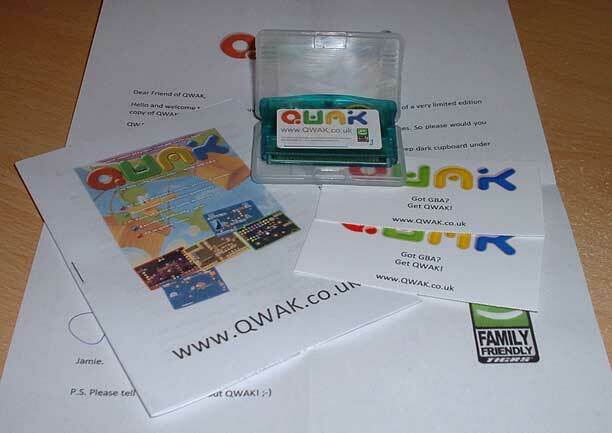 All the GBA Qwaks have flown the nest (we sold all the carts). Thank you for supporting the little guy, and indie game development. This game is not licensed, approved or endorsed by Nintendo® of America, Nintendo Co., Ltd. or any of their subsidiaries. All content within has been developed without access to any official documentation, tools or other information protected by Non Disclosure Agreements. Game Boy® and Nintendo® are Trademarks of Nintendo Co., Ltd.